Whoever thought that Halloween is not that big of a deal in Europe, was absolutely wrong! Everywhere in Uppsala one can feel Halloween (if you open you eyes wide enough,though). Of course, there are no carved pumpkins everywhere, pumpkin spice is not added into everything, there are no children trick or treating, and finding a costume is a relatively hard quest. Ok, where is the Halloween spirit then, you might ask? Well, in every student nation, accommodation area, and in almost every conversation Uppsala University students are discussing costumes, parties, and Halloween themed fikas. Last week my corridor decided to host a Halloween party (we sort of opened the Halloween season in Uppsala). We decorated our corridor, came up with some spooky snacks, put on our costumes and started welcoming our guests. It was a really fun night and everyone came dressed up and in the spirit of Halloween. Parties like this (about 30 people in total) are really good because you get to know people better and have nice conversations with them. 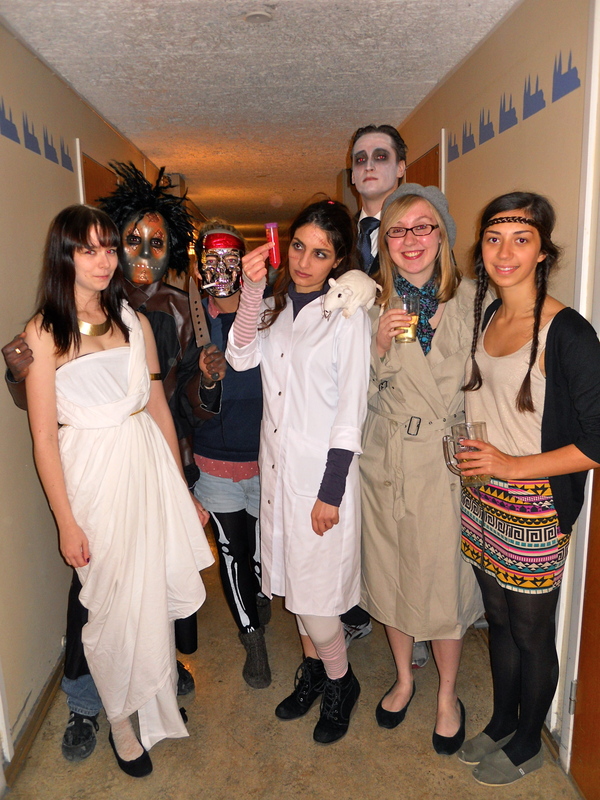 I met a whole lot of Swedes, as well as other international students at our Corridor Halloween Party. Of course, it was an amazing opportunity to bond with my corridor-mates. I already know that I will miss every single one of them. It is hard to think about leaving this place in December – sometimes it feels like I just got here, but when I think back and go all the way to the end of July, I realize how much time I’ve spent in this place I now call home. It was funny that when we came back from our Tallinn trip, the moment I stepped out of our ship, I felt that I actually came back home; oh well, Sweden’s growing on me. That’s why I push thoughts of leaving Sweden out of my mind. Back to the happy topic – there are more Halloween parties coming up this week and next week! 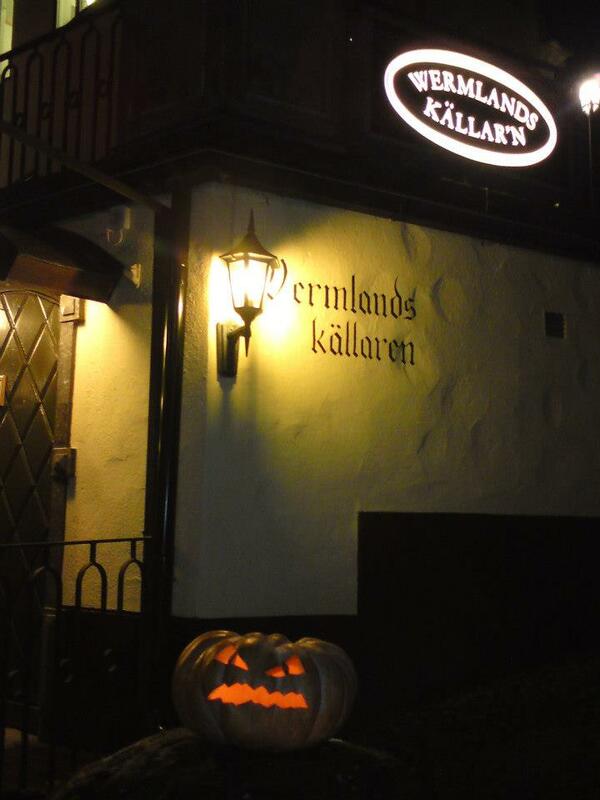 🙂 My nation, Värmlands Nation, hosted the Halloween themed pub night on 10/31 in honor of this amazing time of the year. Wermlandskäller’n- my Nation’s pub that dates back to the medieval times, was all decorated with spider webs and served food and snacks that celebrated Halloween. In moments like those nothing could make me feel like I wasn’t in the States (well, the Swedish language and a high number of blonde people kind of sets me back into reality, but still…). Speaking of spooky and scary things, I have never mentioned this amazing tradition that exists in Flogsta (student accomodation area where I live). Every night at 10pm students go out onto the balconies, open their windows, or go up on the rooftops and scream as loud as they can. Usually this Flogsta scream turns into a competition between the buildings (in Flogsta there are multiple buildings, but students usually live in buildings 1-10): I, for example, live in building 8 and we usually have scream offs against the people living in buildings 7 and 9. It is really fun! And a great way to release stress. There is actually controversy over how this rather interesting tradition started. Some say it was simply a stress reliever, which started during exam times and then became a daily occurrence. The story goes that there was a student who had an important exam and he was studying quite a lot, which made him very stressed out so he opened his window and screamed at the top of his lungs. Others say it started in remembrance of a student who committed suicide in the 1970s. Either way, the tradition is there and it is respected. Below is a video I took of the Flogsta scream one night in August. A cruel winter seems to be another Swedish tradition. It is getting colder and colder every day. The worst thing is that the bike and pedestrian paths get really slippery (especially in the morning and after the sunset) because of the icy surface and walking and cycling become really hard. I have witnessed people fall in front of the supermarket, and I’ve heard stories of my friends who fell off their bikes. Luckily, during the real winter (it’s already cold enough, I don’t even want to know what a ‘real Swedish winter’ is like) the city makes it possible to walk/cycle, and there are busses, so getting to classes and to the city won’t be a problem. This entry was posted on Friday, November 2nd, 2012 at 2:49 pm and is filed under Fall 2012, Indira in Sweden. You can follow any responses to this entry through the RSS 2.0 feed. You can leave a response, or trackback from your own site.